While Pope Francis is visiting the Philippines, we are busy following his steps on television and social media. One day while he was in his pope mobile, I explained to my 3 year old son that Pope Francis is also a priest. Then I asked him if he wants to be a priest, to my surprise he said, “I will be a Pope.” I was actually expecting a yes or no answer. 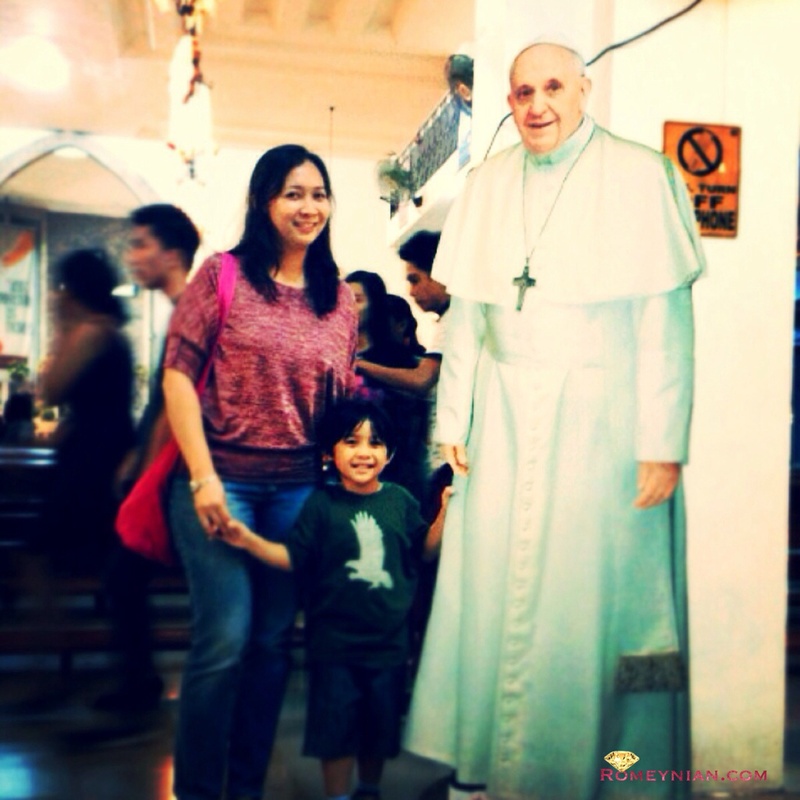 What’s with Pope Francis, even my son wants to be a pope! To me, as a catholic, the Pope is just an ordinary person. He is not God neither is he Jesus. But why do Catholics keep on running and following him all through out his stay in the Philippines? Because he reminds us of our faith, our faith in God, Jesus, and the Holy Spirit. He also reminds us to love our mother Mary. Our faith and love for God is stolen away by technology, junk offered by social media, or our time taken away by our gadget, etc. It is the time when the pope come to visit us that huge or gigantic reminder is set upon us. I’m thankful that the communication line was shut down because my communication line with God was so strong that time. I was able to reflect about my life. I was able to talk to God for a longer time. While Pope was here, it was raining in Manila. In some parts of the Philippines the rain was so bad. Some people think of it as a bad moment. I also asked myself “Why? “Shouldn’t he sun be out on this joyful day?” So I left that question with God. After the Pope left, the following day, I knew the answer. The sun shine the day after the Pope Francis left, and I felt the heat that Manila is encountering daily. Then I thought, if it didn’t rain, then more people will suffer from heat stroke. More people will opt to stay at home. Even the Pope would have a hard time coping up with the heat given his age. Remember while he was in Tacloban? Typhoon Amang was stationary for almost an hour which gives pope Francis ample time to leave Tacloban safely! The Roman Catholic Church is just like Jesus. He came to save lives by preaching, but he didn’t forced us to accept him. Instead he waits for us to come back. He gave us the choice. No matter what religion we belong, as long as we love and follow God and do his commandments we are all his children.